The benefits of blocked isocyanates are well-known in various industries including coatings and adhesives. Blocked isocyanate and blocked polyurethane prepolymer technology enable 1K polyurethane systems with reduced free isocyanates and extended storage stability by minimizing moisture sensitivity of the system. Coating applications such as electro-deposition, electro-static spraying, powder coating, insulating wire coating, and coil coatings have extensively explored this technology because this approach provides a solution to minimize health concerns from free isocyanate exposure while allowing coatings to cure by heat. In the case of blocked prepolymers, they are used in 1K and 2K epoxy-amine adhesives, 1K polyurethane hotmelts, pressure sensitive adhesives, and sealants. Commonly used isocyanate (NCO) blocking agents include Phenol, Nonyl phenol, Methylethylketoxime (MEKO), Alcohols, ɛ-caprolactam, Amides, Imidazoles, and Pyrazoles. The chemical structure of the blocking group has a major impact on the deblocking temperature and cure rate of the coating or adhesive, and also impact volatile content and final properties. Phenols and Nonyl phenols have been employed as isocyanate capping agents for many years, but recent health concerns over toxicity of these molecules motivated consumers to look for safer and affordable alternatives. NX-2026, which is a very high purity, renewable phenolic material derived from cashew nutshell liquid, has been introduced as the most suitable alternative to various phenols based on its favorable deblocking conditions, low viscosity, and better labeling. 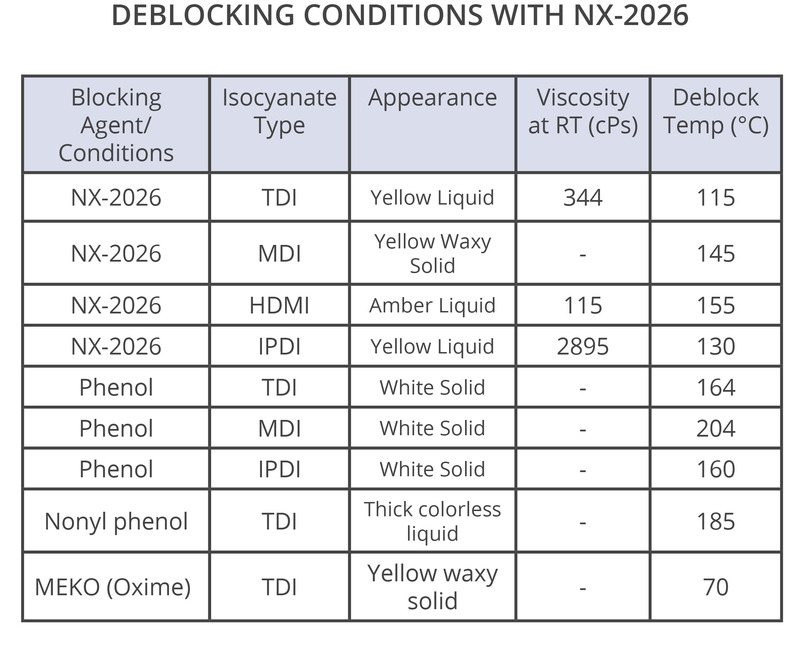 Studies comparing NX-2026 to other deblocking technologies indicate that NX-2026 blocked isocyanates have lower viscosity than isocyanates blocked by phenol, nonyl phenol, and MEKO (oxime). In addition, the deblocking temperature of NX-2026 systems is comparable or lower than that of phenol and nonyl phenol ones. Deblocking behavior was also measured in prepolymers. Polypropylene glycol was selected as the diol to make the prepolymer due to its common use, and the NCO content of the prepolymer was 10.4%. 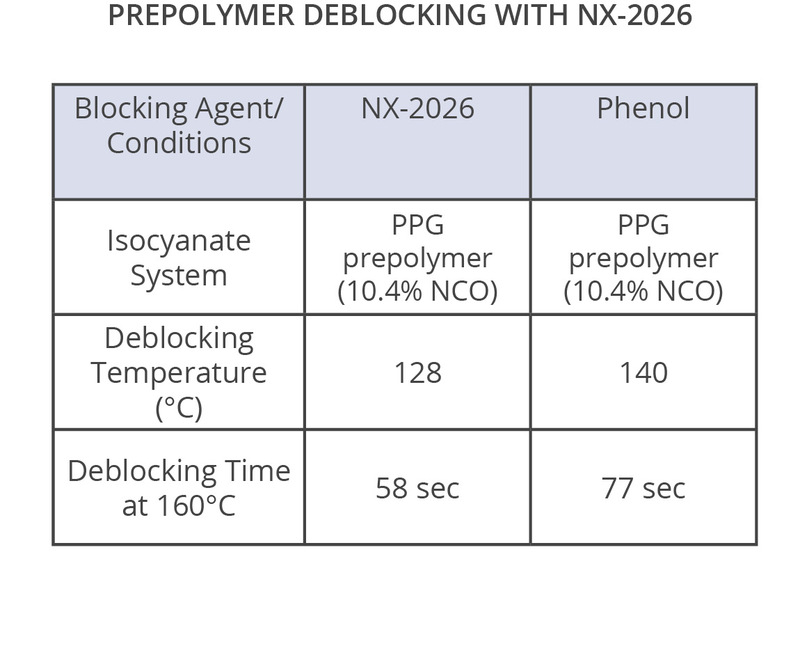 Similar to previous results, both phenol and NX-2026 based prepolymers showed comparable deblocking temperatures with NX-2026-based prepolymer fully deblocking faster than its phenol counterpart. 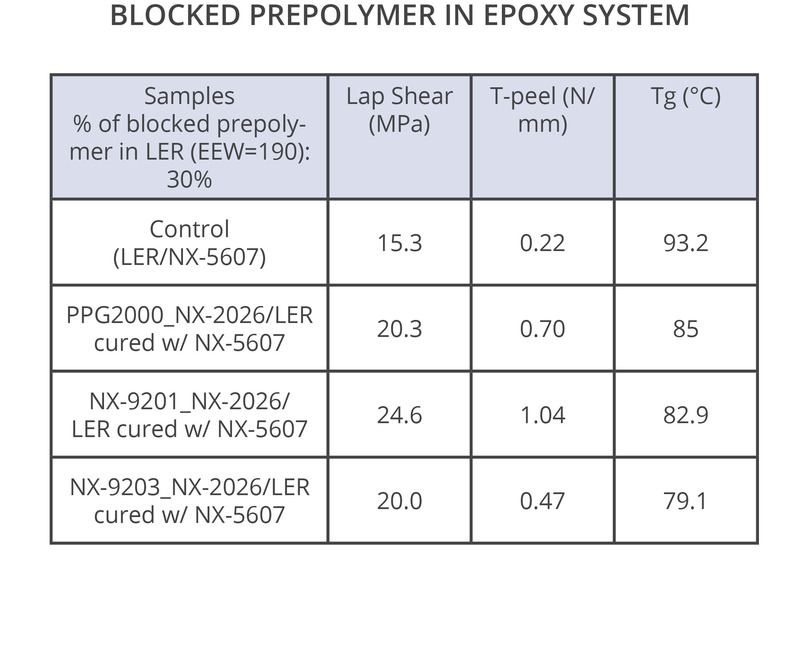 Epoxy systems modified with NX-2026 blocked isocyanate terminated prepolymers deliver improved elongation, lap shear and T-peel. The control sample was based on epoxy only with no prepolymer. This improvement in strength comes from increased flexibilty provided by urethane bonds in the prepolymer and the flexible nature of the NCO blocking agents. 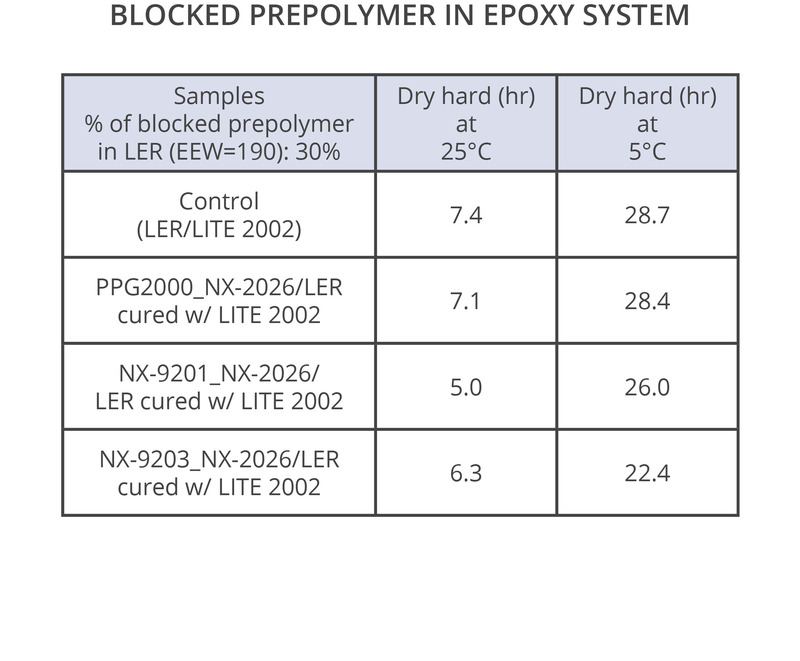 As far as difference in performance between the systems, PPG2000 prepolymers blocked with NX-2026 showed better performance than the unmodified control. However, the typical drawback of PPG-based systems include inferior water and chemical resistance. In this case, CNSL-based diols may be preferred to improve overall durability and performance. Out of CNSL based diols, NX-9201 behaved the best, with excellent bond strength and T-peel. When typical flexibilizers or tougheners are used in epoxy systems, it is common to observe slower cure. However, the use of blocked CNSL-based diol prepolymers help maintain or even reduce cure times providing formulators with an additional benefit.